If you are looking for pageboy hairstyles, check out this gallery. Not every one knows the pageboy hairstyle, but I think most of you have seen this elegant hair style before. The pageboy (or page boy) is a hairstyle named after what was believed to be the haircut of an English page boy. A traditional pageboy is a woman’s hair style with the hair reaching the shoulder and rolled under the ends. Often there is a fringe (bangs) in the front. This style was popular in the 1950s and 1960s. The pageboy was popularized by film actresses who sported it for fashionable look. The name is derived from the hairstyle adopted by pageboys in England in the good old days. From film actresses the hair style came on to fashionable women because it was very appealing to women in general. Present day pageboy is designed for various types of hair. A well cut pageboy is easy to maintain, and in the 1950s it was an edgy, stylish look. 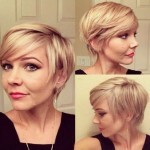 The pageboy haircut is similar to a long bob hairstyle. A pageboy hairstyle is a haircut which is designed for straight, medium to short length hair. In the fifties the pageboy generally stopped above the shoulders but later renditions saw the hair cut to just below the ear, where it curls under; in a reverse pageboy, the hair is curled outwards. Many hairstylists can make a pageboy and explain how it is maintained. This look suits a variety of face and body types. A pageboy flip has the bottom reversed to curl outward. next post Pinterest Launches Open Registration! Follow Us on Pinterest!